As part of our commitment to take responsibility for our environmental impact, we have offset our carbon footprint with Carbon Retirement. Carbon Retirement buys industrial ‘pollution permits’ on our behalf and permanently removes them from the carbon trading system. Ensuring that the price of offsetting in the trading market truly reflects the crisis we are facing. These permits are needed by industrial companies, so reducing the number available forces companies to reduce their emissions and incentivises investment in low carbon technology. We believe this is the most effective and ethical way to take responsibility for our unavoidable emissions because it tackles the problem of developed-world emissions head-on and reduces our reliance on fossil fuels, moving us more swiftly to a low carbon economy. In 2009 we introduced a Management System into the practice, which sought to build on the processes and initiatives developed through the ethos of the practice to attain ISO 14001 and ISO 9001 certification. Through this scheme the practice began to measure its energy and resources consumption and subsequent carbon emissions with a view to becoming carbon neutral. Over a 12 month period Black collected data relating to office energy use, waste, paper, commuter travel and business travel to calculate our yearly emissions. These totals are then used to set targets for the coming year. Once the initial data was collected, where (and with who) to offset our carbon was another challenge. There are a number of organisations that offer carbon ‘offsetting’ using the Kyoto Protocol’s Clean Development Mechanism (CDM). The CDM is mainly used by industrialised countries to help meet their emissions reduction targets, but it is also used on a voluntary basis by individuals and organisations wanting to offset their carbon footprint. Through the CDM, greenhouse gas emission reduction projects are built, in places such as Thailand, India and South America which are funded by carbon credits bought by buyers in developed countries. All of which is laudable, but recent research suggests that only a third of the money spent on offsetting actually goes to fund environmental projects. For every £1 a statutory buyer spends on carbon offsetting under the CDM, typically just 31p is spent on the project’s set-up and maintenance costs and for voluntary buyers going through a carbon offsetting retailer, rather than dealing direct with brokers, the amount typically making it through to the project is even smaller, at just 28p. The rest of the money is ‘lost’ to investors, brokers and other participants in the process. So what should businesses do to address those unavoidable emissions they emit? The online service "Carbon Retirement" offsets carbon emissions on behalf of consumers and businesses by ‘retiring’ allowances that would otherwise be used by big polluting companies that are regulated by the European Union’s Emissions Trading Scheme (ETS). Carbon Retirement from Carbon Retirement on Vimeo. The ETS sets emissions caps for heavy industry in the EU and allocates the polluters with a fixed number of permits – each one the equivalent of one tonne of CO2 – which they can then either trade (if they reduce their emissions) or use against their CO2 emissions. 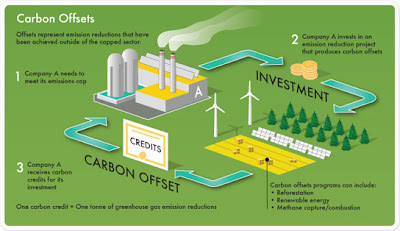 Carbon retirement works because it offers “a clear environmental impact” and it tackles the emissions created by developed countries head on, it's the most effective method of offsetting, because it's the only way you can be 100% sure that the emissions reduction you're paying for will definitely take place as they buy the permits and permanently remove them from the system. As a business that invests in voluntary offsetting we are looking for value-for-money, and are concerned about the inefficiencies in the supply chain for project-offsets, which mean that a lot of the money might not end up being directed towards reducing emissions. Carbon Retirement for us delivers a true impact in the fight for climate change. Their retirement scheme is straightforward and transparent and in keeping with our philosophy of challenging preconceptions by creating a market changing approach. Your information is really awesome as well as it is very excellent and i got more interesting information from your blog.